Anchorman Race Report – Winner! 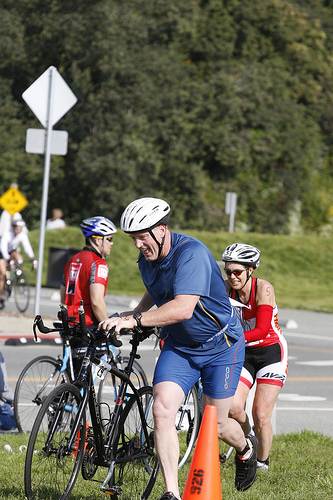 Last Sunday I raced the inaugural San Francisco Anchorman. Great race! (check and see if there is an Anchorman race in city near you!) 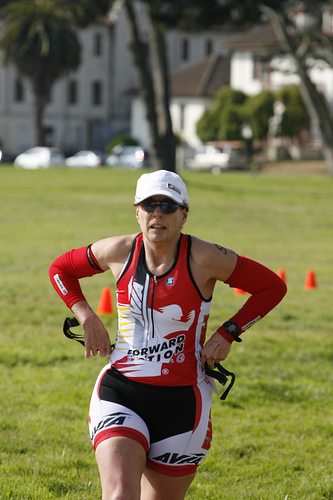 If you have always dreamed of doing Escape from Alcatraz you should consider this race as a solid alternative. The course is very similar but it’s half the distance for 1/4 of the price. All the thrills without emptying your wallet – good stuff! My particular participation in this race was, in a word, Supah! I had a really good time in spite of having to drag my tired kiester out of bed at 3:45 AM. Is that even legal? Had to be done, though because I needed a few cups of coffee and a bowl of oatmeal and it was into the car and off to the big city! All of that went flawlessly. This race was pretty small (too small – you should ALL do this race next year!) so there wasn’t a bad spot in transition. I found one of the many great spots, set up and headed off to find a potty. Turned out the only ones available had flush toilets and running water. Ahhhh…. Back in transition I said hello to fellow team mates, put on my arm warmers and started to pull on my wetsuit. If you are doing a race on a chilly day this little trick will save you a ton of time in transition. Anyhow, I got the wetsuit 1/2 way on, put one arm in and realized I didn’t want to do that because we still had to ride a bus to the ferry (it was a bay swim) so I decided not to put the other sleeve on. But I didn’t want to take the first one off, either. So I didn’t . I just walked around and got on the bus with one arm on and one arm off, wearing an arm warmer. It was a look. We got to the ferry landing for what we thought would be a short wait. Only it wasn’t. There was a snafu with the buses and I don’t know what else that left us hanging out there for almost an hour. That part didn’t bother me. By then I had pulled up the other sleeve and didn’t look so much like a crazy woman. The problem was that I really needed to pee only I had a wetsuit on and I was not in the water and i was not really willing to run to the rest room and deal with it as others were doing. So I just held it. Finally the ferry was in, we were on it and on our way to the spot where you jump off. I really had to pee but I wasn’t about to chance hitting the head on the boat and jumping last so I just dealt. And then I jumped and HOLY MOTHER OF GOD that water was cold – roughly 55 degrees. That might have scared the pee right out of me but it didn’t and the timing mat was on the boat so it was game on – SWIM! So I swam. I tried to stop and tread water hoping I could, you know, warm things up but no. These things take time for me and time was of the essence – I swam on. Then I tried to focus on relaxing and just letting go but that was slowing me down and I’m slow enough in the water so I just decided to HTFU and swim. For once I held a decent line and didn’t have to have a kayak guy chase me down or tell me where to go. This was one of these races where you get out of the water, pull off the wetsuit, put on shoes and start running. The run was about 3/4 of a mile and it was a perfectly reasonable way to warm up. But I really had to pee. There was nothing to be done about that, tough so I just sucked it up and kept going. Finally I get to my bike and it’s off with the running shoes, on with the socks (pre-powdered), on with the bike shoes, on with the helmet, on with the sunglasses and I’m out of there, trotting across the grass to the mount point and boom! It took about 1/4 of a mile to have to start climbing. I get up the first hill the guy says “good job – just 2 more!” This was not what I wanted to hear because you know what? I had to pee and climbing was not helping but oh well. I just kept going because this ride is onlyl 9 miles so how bad could it be? So it was a little bit hard. Be that as it may I dropped 9 people on the bike which has to be the most exciting thing I’ve ever done in a race – EVER! I was so happy with myself I forgot about how bad I needed to pee. My other favorite part of the ride was when I was heading out for loop 2 going up that steep part right at the beginning. I got passed by a guy on a very nice Kestral who was just mashing his way up that incline. I thought “oh dear – I don’t think that’s going to work out for you, Mr.” but I let him go. It didn’t take very long before I was spinning right past him on the last big climb and I never saw him again until he finished the race – 20 minutes after me. He’s 41. HA! I finished the bike and headed into transition to swap the helmet for a hat, the shoes and grab my race belt. Off toward the bridge and right past those nice potties with the flushers and the running water. OMG but I’m on a mission! I’ve dropped these 9 people and I want desperately (and futilely) not to have any of them drop me on the run. As if… and I really had to pee but there was nothing to be done about it – I had to run. Down to the bridge, around the cones and back to the stairs. The long stairs. I got up those and remarked “there’s no sand!” and the guy up there pointing the way said, “not yet”. The famous sand stairs are a part of this race but I sort of forgot where they were. The run went on and on and it went up and up. And then it went up some more until we got to Baker beach and the famous sand stairs. Only problem was a whole lot of sand was missing so a lot of them were just logs that were cabled together. Macca says “don’t bother running them” and I thought that sounded like a fine idea. Kind of hard to run on logs that go down a steep slope anyhow. So down to the bottom, high five the guy who is there to tell you to turn around and it’s back up we go – ooph! I thought about just running into the water to pee but no – I had to keep going because someone had already passed me on the run and there were more on the way. The way back was way more fun than the way out. Back past the potties with the flushers and the running water and holy crap I’m desperate now and into the chute! Race over. I did a 180 to head back to the potties with the flushers and the running water but of course I had to stop to say hi to my team mates and have a little chit chat time. It’s a wonder I didn’t just die on the spot but I didn’t – I made it back to the potties and peed about 3 gallons and felt so good I considered just curling up on the floor for a nap but I figured other people also needed those potties and I was thinking I had a trophy to fetch. And I did get a trophy. I would have gotten a tropy if I had stopped and peed, too because I was the only one in my age group but if I had honored my bladder I would not be able to say that I beat both of the women in the 50-55 group and both of the women in the 45-49 group and 2nd and 3rd place in the 35-39 group so I earned that trophy! I suffered and sacrificed for it and I won it fair and square. I’d go take a picture of it to post but I need to pee and I’m not putting it off. 7 Responses to Anchorman Race Report – Winner! ha ha ha ha BRILLIANT!!! now THAT’s what I call a race report! Well done! That’s a whole lot of first places, missy. Not only am I impressed with your athletic prowess, but you held it for how long? Through 3 sports? You need another trophy for that! That’s a great way to win a race. I certainly wouldn’t have been able to make it without a pitstop. Big congratulations!! Most excellent! Way to hold that bladder. Congrats Mom! Can’t wait to see you Tuesday. You are one awesome woman, both for the trophy and for the holding it! Congrats on the trophy (pix?) and smoking the course! This is awesome, Pamela! Congrats. I’ve always wanted to do the Alcatraz swim – this race sounds like a great (cheap) option for it. Thanks for the report.